Do you have pets? Are they naughty pets? If you have pets and need Carpet Pet Stain Removal in Birmingham AL 35242, then you’ve come to the right place to try an inexpensive method. For carpet pet stain removal, all it takes are a few simple household items and you should be well on your way to cleaner carpets. · First remove solids being careful not to push stain into pile. · Sponge the area with a solution of 1 teaspoon mild non-alkali detergent and 1 pint lukewarm water. · Blot the stain with an absorbent pad. · Continue the sponging and blotting until no more stain is removed. · Blot excess liquid, and continue treatment until no more stain is removed. · Place an absorbent pad over the damp area and weight it down. · When no more liquid is absorbed, remove the pad and allow area to thoroughly air dry. Still struggling with the pet stain in your carpet? Let HEAVEN’S BEST CARPET & RUG CLEANERS of BIRMINGHAM help you achieve the ultimate desired results with their professional carpet stain removal system. Heaven's Best's Dry-In-One-Hour carpet cleaning removes soil and stains that other cleaners leave behind. Our exclusive cleaning solutions are safe for people, pets, and the environment. Our special carpet cleaning process uses less water, which allows your carpet to be dry in one hour, letting you get back to your daily schedule sooner. Call us today at (205) 618-9150 to schedule our special Pet Puddle Treatment. 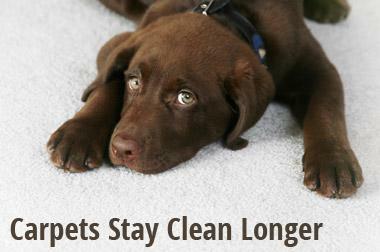 Don’t fret over Carpet Pet Stain Removal in Birmingham AL 35242! Schedule a Carpet Cleaning Today!